Word documents can get huge, unusually long, complex documents with loads of embedded images, fonts, and other objects. But it also seems like documents can grow out of hand for seemingly no reason at all. If you’re dealing with a huge document, here are some things you can try to reduce its file size. When you’ve got a Word document that’s a bit too large, the first thing you’ll try is compressing the images in it. This is partly because sites like How-To Geek have written comprehensive articles explaining how to do this, and partly because, well, images always seem to bump up the size of a Word document beyond reason. You should still go ahead and follow the tips we wrote in that article because if you’ve got images, they’ll help you. But if you haven’t got images, or you’ve followed those tips and need to reduce the file size more, we’ve got you covered. We’ve got a lot of tips to share, so we’ve broken them down into things that will definitely help reduce the size of a Word document, things that might help, and some commonly-suggested tips with which you shouldn’t bother. Not every tip you find will be useful to you. Sometimes this is because they don’t apply to your situation (if you’ve got no images then tips on compressing images won’t be of use) but sometimes the tips are just plain wrong. We’ve tested all of the tips in this section, so we know they work. To convert your .doc file, open it in Word and click File > Info > Convert. 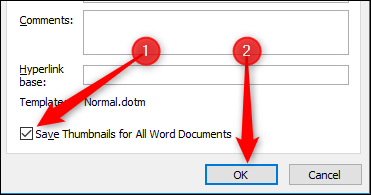 Click “OK” on the prompt that appears, click the “Save” button, and Word converts your document to .docx. Word does this conversion by creating a brand-new version of the document in the new format, so you’ll still have your old .doc version available. We tested this with a sample 20-page .doc file that contained six images, various tables, and formatting marks. The original .doc file was 6,001KB, but the converted .docx file only weighed in at 721KB. That’s 12% of the original size. Nothing else we suggest below will do more to reduce your file size, so if you have .doc files you can convert to .docx, your work might be done. When you copy and paste an image into your document, Word makes certain assumptions about how to deal with it. One of these assumptions is that you want the pasted image to be a BMP format, which is a large file type, or sometimes PNG, which is still quite large. A simple alternative is to paste your image into an editing programme instead, save it as a smaller format like JPG, and then use Insert > Picture to insert the image into your document instead. Pasting the small screenshot below directly into an otherwise blank Word document made that document’s size jump from 22 KB to 548 KB. Pasting that screenshot into Paint, saving it as a JPG, and then inserting that JPG into a blank document caused the document to jump to only 331 KB. That’s just over 40% smaller. Even better, using the GIF format resulted in a document that was over 60% smaller. Scaled up, that’s the difference between a 10 MB document and 4 MB document. Of course, you can’t always get away with this. Sometimes, you’re going to need the better image quality that formats like BMP and PNG can offer. But if it’s a small image or you don’t need super high quality, using a lighter weight format and inserting the picture can help. When you edit an image in Word, it stores all of your image edits as part of the document. The means if you crop an image in your document, Word still retains the full original image. Change an image to black and white, and Word still retains the original full-color image. This increases the size of your document unnecessarily, so when you’ve made changes to your images, and you’re sure you don’t need to revert those images, you can have Word discard the editing data. But better than removing unnecessary data from your document is not having that unnecessary data in your document in the first place. Any edits you can make, even simple ones like cropping or adding an arrow, are best done in an image editor before you insert the image into the document. Yes, we said at the start that this article was about other ways to decrease your file size, but most articles on this subject tell you how to compress your images one at a time (including our article), and here at How-To Geek we’re all about finding better ways to do things. This opens the “Save As” dialog box, where you access some additional options. 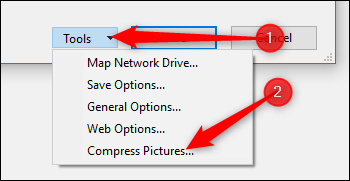 Click Tools > Compress Pictures. This opens the “Compress pictures” panel, where you can decide on what compression you want to apply to all of your images at once. The “Apply only to this picture” option is grayed out because this is an all or nothing tool—either all of your images will have these options applied when you save the document or none of them will. So if you want to choose different options for different images, this won’t work for you. But if you’re looking to compress all of your images in one go, this is the option to use. 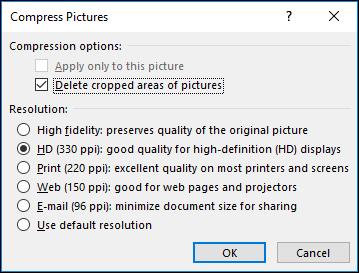 Select your choices, click “OK,” and then save the new version of your document with all of the images compressed. Unless you’re using an unusual font from a galaxy far, far away, it’s almost certain that anyone with whom you share your document will be able to read it using their copy of Word (or a free alternative like Libre Office). So why would you want to waste space in your file by embedding the fonts? Stop this happening by going to File > Options > Save and turning off the “Embed fonts in the file” option. You might think that this wouldn’t make much difference, but you’d be wrong. If you have font embedding turned on and have the “Do not embed common system fonts” option turned off, the difference in file size is almost 2 MB. Even with “Do not embed common system fonts” turned on (which means fonts like Calibri, Arial, Courier New, Times New Roman, and so on aren’t included), the file is still almost 1.3 MB bigger. So yes, stop embedding fonts in your document. We recently showed you how to embed or link an Excel spreadsheet in a Word document (and you can do this with other files, like PowerPoint presentations or Visio diagrams, as well). If you can link to the spreadsheet instead of embedding it, you’ll save yourself most of the size of the Excel file. You won’t save all of it, because the linked spreadsheet will still add some size, but your document will be much smaller with a link than a full embed. Of course, there are drawbacks to linking as well as benefits, so be sure to read that article to understand them before you do this. Back in the day, Word let you store a thumbnail image of the document so that Windows could show you a preview in File Explorer. These days, File Explorer can do this on its own and doesn’t need help from Word, but the option is still there in your document. In our 721KB test document, turning this option on increased the file size to 3247 KB. That’s 4.5 times the size of the original file—for nothing. 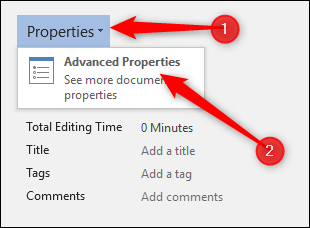 You’ll find this setting at File > Info > Properties > Advanced Properties. The name of this option is a bit misleading because turning it off here only affects the document you’ve got open, even though it says, “all Word documents.” If this is turned on by default when you create a document, then you’ll need to turn it off in the Normal.dotx template and Microsoft has provided excellent instructions for doing this if you’re not sure how. Not only is personal information adding to the size of your document, but it’s also potentially giving your readers information you don’t want them to have. There might also be information that has been formatted as hidden, and if you don’t need this hidden text in the document, why not get rid of it? Remove this unnecessary information from your document by heading to File > Info > Check for Issues and then clicking the “Inspect Document” button. 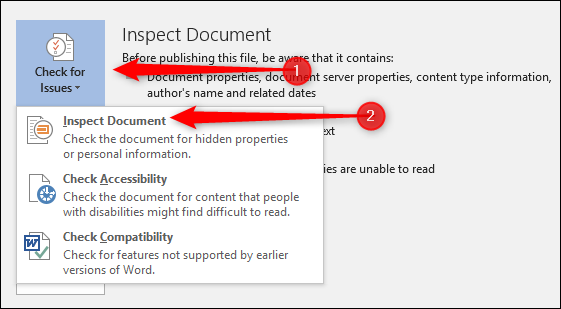 Make sure “Document Properties and Personal Information” is switched on and then click “Inspect.” When the Inspector has finished running, click “Remove All” in the “Document Properties and Personal Information” section. This action reduced our test file size by 7 KB, so not a tremendous amount. However, it’s good practice to remove personal information from your files, so you should probably do this anyway. Be warned that you can’t recover this data after removing it, so make sure you’re happy for it to go before you remove it. You can do the same thing for the “Invisible Content” and “Hidden Text” options, but this will only make your file smaller if you’ve got hidden content. One of Word’s great features—in fact, one of the great features of every Office app—is AutoRecover. This feature makes regular backups of your file as you work, so if Word crashes or your computer restarts unexpectedly (such as when Windows does a system update overnight), you’ll be presented with automatically recovered versions of open documents the next time you start Word. Of course, all of these versions add to the size of your file, so if you turn off AutoRecover, your file will be smaller. Go to File > Options > Save and turn off the “Save AutoRecover information every [x minutes]” option. This won’t make an immediate difference, but it will stop new AutoRecover versions being added to the file as you work on it. Just be warned that you’ll no longer have AutoRecover versions so if Word crashes or closes unexpectedly, you’ll lose all of your work since the last time you saved it. As you work on a document, Word saves various things in the background to help you. We’ve shown how to turn these off where possible, and how to delete the data that Word collects, but there will likely still be things in your document you don’t need. If you find yourself subject to this kind of document size creep, you can create a new document and then copy everything over to it. Start by creating a new blank document. Select all of the content in your current document by pressing Ctrl+A. In the new document, press Ctrl+V to paste everything. This copies all your text, sections, formatting, page layout options, page numbering—everything you need. Your new document won’t have any of the previous background saves, AutoRecover information, or previous versions, and this should reduce the file size. Bear in mind doing this will copy over any editing data in your images, so you might want to remove that from the original document first before copying everything over to your new document. If you don’t, it’s no big deal. You can still remove it from your new document. We can’t tell you how much this will save, because it could be anything from a few kilobytes to a lot of megabytes, but it’s always worth doing if you want to strip as much fat as possible from your document. As a bonus, we’ve also seen this copy/paste to a new document trick solve weird errors in Word documents that were hard to track down otherwise. Some tips seem like they would help, but we couldn’t get a positive result with them. We’re not saying they won’t help reduce your file size, but it seems like you’ll need a particular set of circumstances to get any benefit from them. We highly recommend trying the tips from the previous section first, and then giving these a go if you need to. This setting is enabled by default and saves the document in the background as you’re working on it. The idea is that when you click “Save,” there will be fewer changes to save, and so it will save a lot quicker. This is largely a throwback to the days when Word took up a proportionally larger amount of system resources, and on modern systems, it’s probably not required, especially if you’re not editing hugely long or complicated documents. The jury is out on whether this makes a difference to file size. Leaving a document open with this setting on didn’t make any difference to the size of our test document (whereas leaving AutoRecover turned on did increase the file size). Making modifications over a period of about 30 minutes also didn’t cause the document size to change appreciably, regardless of whether “Allow background saves” was on or off. Neither did having it turned off change how quickly the document saved. In short: this one is up to you. If turning it off doesn’t reduce your file size then leave it on, because anything that Word does to save your documents automatically is a good thing. RTF stands for Rich Text Format, and it’s an open standard for documents that provides a bit more formatting than plain text, but not all the bells and whistles of DOCX. The idea of converting a DOCX to RTF is that it strips away all of the extra formatting and any hidden data so that when you save your RTF back as a DOCX file, the file size will be smaller. Converting our 20 page, 721 KB test document to RTF turned the file size to 19.5 MB (so don’t use RTF if you want a small file). Converting it back to DOCX resulted in a file that was 714 KB. That’s a 7 KB saving—less than 1%—and because RTF couldn’t handle some of the simple table formatting we used, we had to reformat….which brought the size back up to 721 KB. This one doesn’t seem like it will have many benefits to your document, especially when the modern DOCX has so many formatting capabilities that RTF can’t handle. This is the same idea as converting to RTF, except that HTML is a web format. Our conversion test showed almost identical results to using RTF. We tried this on our 721 KB DOCX file, and it converted it to a 383 KB HTML file. Converting it back to DOCX resulted in a 714 KB file. That’s a 1% saving, but it did mess with the formatting, especially the headers, and these would have to be redone. A DOCX document is a compressed file, like an archive you make with 7-Xip or WinRar. This means you can open it with one of those tools and see all of the contents. One tip you might see is to extract all the files from your DOCX, add them to a compressed archive, and then rename that archive to a DOCX file extension. Hey presto, you’ve got a Word document that’s been compressed! In theory, this sounds plausible but using both 7-Zip and WinRar and various archive formats we found that every time we tried to open the .docx file we’d created, Word told us that the file was corrupted. There may be some merit in this idea—our 721 KB file did end up as only 72 KB—but we wouldn’t recommend it unless you want to spend a lot of time playing around with it to try and get it working. Also, the saving might merely be because the compression process has removed/compressed something that stops Word from opening the document, but we can’t be sure. There are a few suggestions floating around the internet that sound sensible but won’t have much of an effect. That’s not to say you shouldn’t try them, just that you shouldn’t expect much impact on the size of your document. Word keeps previous versions of your document as you work on it. This is the AutoSave functionality, and some people suggest deleting these by going to File > Info > Manage Document and removing any old versions. However, there’s no point doing this because those old versions are stored in the Windows file system, not in your Word document. Deleting them won’t make your document any smaller. If you want to remove any previous version information from within the document, either copy the content to a brand-new document or do a File > Save As to save to a new document, as we suggested previously. 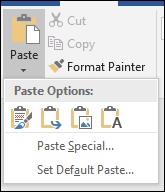 When you want to copy and paste from one document into your current document, you can use different paste options. The default option used if you click the “Paste” button (or press Ctrl+V) is “Keep Source Formatting.” This copies non-default fonts and formatting like bold, italics, and so on. But if you click the “Keep Text Only” option instead, this will—or so the theory goes—reduce the file size by removing the formatting. We tried this with a 20-page document that had various formatting applied to text on every page, and the average size difference was just under 2 KB per page. This might be significant if you’ve got a 250+ page document, where it would total up to around 0.5 MB, but are you really going to have a 250-page Word document with no formatting? Probably not, because it would be mostly unreadable, so you’d lose your savings when you add the formatting back in. Any benefits to this method are probably down to the tip we gave above – copy and paste the whole document into a new document to remove previous versions, old editing changes, and so on. We tried this with a 20-page document using “Letter” size that was 721 KB. We changed the size to “A4,” “A5,” (which is half the size of “A4”), and “B5” and our document remained a steady 721 KB every time. In other words, it made no difference to the file size at all. There is a setting in File > Options > Advanced named “Embed linguistic data,” and you’ll see tips in various places telling you to turn this off. On the surface, this sounds reasonable—wouldn’t extra linguistic data increase the size of a document? In short, the answer is no if you’re using a modern .docx file. Word handles the linguistic data behind the scenes, and it doesn’t take up any room in the document. Turning this option off can make a slight difference to older .doc files, but even then only if you’ve used a handwriting tool and Word has some “handwriting recognition correction information” to store. Otherwise, it makes no difference at all. That’s our fairly comprehensive list of ways you can cut your Word files down to size, but we’re always on the lookout for new methods to try (or debunk). Fire away in the comments if you know a technique that we’ve missed, and we’ll check it out!